Do you have a vision for your dream home? You’ve probably been envisioning it for years, making adjustments as you go along to accommodate the twists and turns of your life. Are you ready to bring that dream to life? If so, a custom home builder in NC can make your dream a reality. They can design your new home to match your vision. You can be involved in every aspect of the design process and choose every feature and detail so that your home is truly your own. 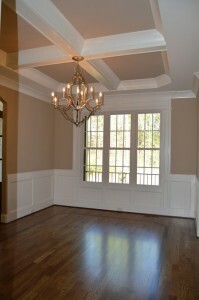 If you want a unique home, R & K Custom Home builders in Greensboro, NC, can design your home to be an original. If you already own land or have a certain lot in mind, we can build on it. Just as important as the home itself, the lot on which it will be situated should match your vision. If you don’t already have a lot picked out, you can choose from many lots that are already set aside for R & K Custom Homes. We build new homes in the Greensboro area, in a variety of neighborhoods that offer different types of settings. The new home of your dreams built on the lot of your dreams is a winning combination. When your home is custom built, you can choose every option, as opposed to production or spec homes where you have a short menu of choices. Choosing from just a few pre-designed floor plans does not make a home unique. When you design a custom home, you choose everything from the floor plan of each level to the color of the kitchen backsplash tile. You have a say in every part of the design process. If you have a certain price range in mind, R & K Custom Homes can help you to stay within your budget and still get the home of your dreams. You can prioritize your list of wants and choose the things that matter the most to you. You can substitute more economical products for the higher priced items to help keep costs down. But the end result is still a unique, custom built home that reflects your personality and that of your family members. R & K Custom homes has been building beautiful, new, state-of-the-art homes since 1992. We have produced over 300 unique new homes in Greensboro and the surrounding area for our satisfied customers since then. If you are interested in designing and building your dream home, request a free consultation here or call 336-652-3006.